5/9/2016 - Leaders of the G20 countries meeting at their Summit in Hangzhou, China, have called on the OECD to help develop an agenda to build a stronger, more innovative and inclusive world economy. The leaders endorsed a series of Action Plans to implement their growth strategies covering a broad swathe of policy areas – from innovation and skills to entrepreneurship and investment finance; from improving productivity and trade to tackling money laundering, combatting tax avoidance and reducing overcapacity in the steel sector. A central focus of China’s G20 presidency has been the need to identify new driving forces for economic growth. The OECD has contributed ideas, analysis and data in support of the Presidency's goal to integrate an Innovation Action Plan which aims to support investment in science and technology, improve skills and encourage the exchange of knowledge. In their communique, the leaders welcomed the work by the OECD and other international organisations on the measurement of the digital economy and committed to expand broadband access and investment in the information, communications and technology (ICT) sector. They also urged countries to seize the opportunities of the so-called New Industrial Revolution, particularly those offered by new technology in manufacturing. They agreed to strengthen cooperation and research and to support workers most affected by technological change. The urgent need to harness new sources of economic dynamism was underlined to Summit leaders by Mr Gurría. The global economy remains stuck in a low-growth trap, he said. Eight years after the start of the crisis unemployment and inequality remain high. Growth in wages and productivity is weak while trade and investment is low. Despite a 2014 G20 commitment – monitored by the OECD and IMF – to raise global GDP by an additional 2% by 2018, measures implemented so far will only add around 1%. To counter a rising risk of protectionism, the G20 leaders said they would endeavour to build an open world economy by strengthening trade and investment cooperation. OECD’s contributions in this area have included helping to draw up guiding principles for investment policy-making and providing analysis to support government efforts to reduce unnecessary trade costs, open services markets, and prioritise trade facilitation measures. Investment is the lagging engine of the world economy, and the G20 underscored its important role for a more dynamic global growth. The Secretary-General told G20 leaders that effective implementation of reform was already bearing fruit in the areas of tax transparency and in tackling evasion and avoidance. So far 85 nations and jurisdictions – including many developing countries – have committed to implement and monitor the Base Erosion and Profit Shifting (BEPS) project through a new G20/OECD Inclusive Framework. The BEPS project closes gaps that allow corporate profits to “disappear” or to be artificially shifted to low or no tax environments. Meanwhile, 101 jurisdictions will automatically exchange financial account information by 2018. Already countries have identified almost 55 billion euros in additional tax revenues thanks to voluntary disclosure and similar programmes. Leaders asked the OECD to prepare a list of non-cooperative jurisdictions by their Summit in 2017. On tax reform, as across all the Action Plans discussed by the leaders, robust implementation and coherence among participating countries will be crucial, as the challenges of an increased integrated global economy require continued cooperation. She also emphasised OECD contributions on other important areas such as the role of skills and training, on investment in infrastructure, and support to small and medium-sized enterprises. 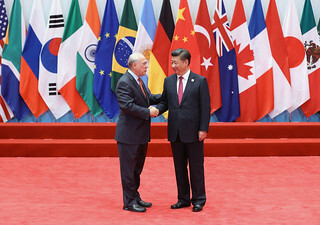 The G20 Action Plan for sustainable development was given a boost on the eve of the Summit when the US and China, the world’s two largest economies, announced they would formally ratify the Paris Climate Change Agreement. The two countries also released peer reviews of their fossil fuel subsidies – a move welcomed by the OECD, which had chaired the peer review process. The OECD also contributed analysis on green finance, including green bonds, institutional investors and investment governance. Further information on the OECD’s comprehensive contribution to the work of the G20 is available at www.oecd.org/G20 or contact andreas.schaal@oecd.org. More information on the G20 Hangzhou Summit and the final communique is available here. Journalists can also contact the OECD Media Division (news.contact@oecd.org; tel: + 33 1 4524 9700).